Teaching is about more than a career. It's about igniting a passion for learning. Our M.A. in Education K-12 will enhance your teaching career by building on your previous classroom experience. The program is designed for teachers already working in K–12 classrooms who want to improve their teaching skills and expand their leadership opportunities. Courses will stir up a passion for teaching and a compassion for children and youth. You’ll engage in thoughtful activities that promote learning and find ways to lead and serve in your context. Teaching provides a platform for change—and we’ll show you how to use it for good to improve your community and our world. The MA in Education K-12 program is comprised of 23 core credits and one of the following 9-10 credit concentrations. 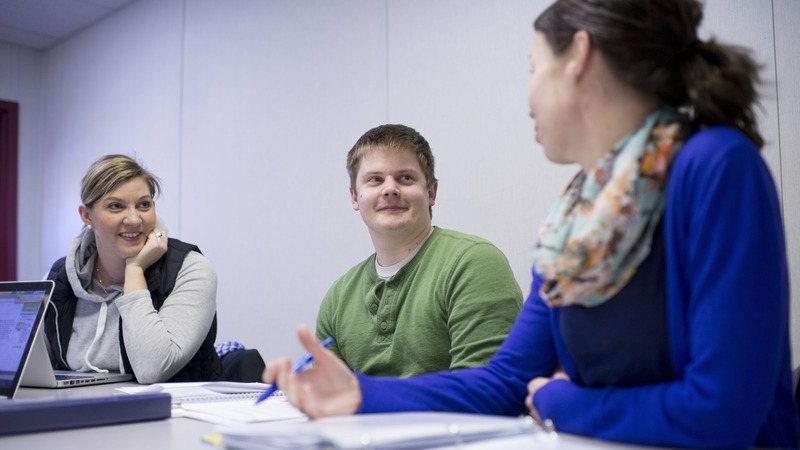 Approached from a Christian worldview, our program develops teachers who are knowledgeable, collaborative, and caring—reflecting a strong moral framework of integrity and compassion. We understand how important it is for teachers like you to stay current in our rapidly changing educational environment. From new technologies to teaching for a differentiated student population and understanding new educational models, we’ll help update your skills and provide new ones so you’re prepared for changes in education. You’ll be able to choose from 7 concentrations, allowing you to specialize in your area of interest and preparing you to step into leadership roles in your setting. All the courses in the program are taught from a foundation of Christian faith, which adds meaning to the teaching profession. Plus, you’ll have the opportunity to consider educational theory and practice from national and international viewpoints so you learn best practices for teaching from a global perspective. Courses provide a supportive and collaborative environment in which to express ideas. Alongside your peers, you’ll foster meaningful friendships, lifelong connections, and a valuable network. Assignments and activities have been thoughtfully designed to promote engaged learning and dialogue. Our professors bring excellent teaching skills along with innovation, a commitment to their students, and thorough engagement—whether they're teaching in a classroom or online. Like you, they bring real-world experience to the classroom to make learning and coursework relevant to your educational setting. We’re committed to helping you succeed from admission to graduation. In fact, 100% of our graduates said they were satisfied with the quality of instruction in their M.A. in Education K-12 coursework (Bush Exit Survey). Once you’re enrolled in the program, you’ll be supported by a program director, professors, and advisors who are caring and ensure that you are equipped for success. Nearly all of our students are full-time teachers, have families, and are involved in their community while in graduate school. Our schedules make it easier for you to earn your degree by having limited in-class time so you can complete your assignments when it works best for you. Our M.A. in Education K-12 program will help you gain the skills and knowledge you need to be a confident teacher prepared to serve students, families, and communities in a complex and changing educational environment.